Iranian President Hassan Rouhani has called on the European Union to take practical measures to preserve the Iran nuclear deal following the US withdrawal from the nuclear deal. He made the remarks during a meeting with Belgian Prime Minister Charles Michel on the sidelines of the UN General Assembly session in New York. During the talks, President Rouhani said Iran-Belgium relations are developing in a good direction and added the Iran nuclear deal can play a key role in strengthening mutual ties between the two sides. Rouhani underlined that safeguarding the nuclear deal is a heavy joint responsibility on the shoulder of the signatories of the JCPOA and said the EU is now facing a sensitive test not only before Iran but also the whole world and everyone is waiting to see whether or not the Europeans will remain committed to their pledges under the deal. Elsewhere in his remark, the Iranian president said that the US cannot achieve its goal by exerting pressure on the Islamic Republic and said preserving the JCPOA is an international responsibility and all states should play their role in the issue. “As a key political and economic player in the world, the EU’s role in safeguarding the JCPOA is highly critical,” he noted. The president then said Iran has remained faithful to all its commitments under the nuclear deal and the issue has been confirmed in several reports by the International Atomic Energy Organization. “The Europeans’ political stance towards the JCPOA seems good but the Islamic Republic of Iran expects the bloc to take some practical measures to safeguard the deal,” he said. 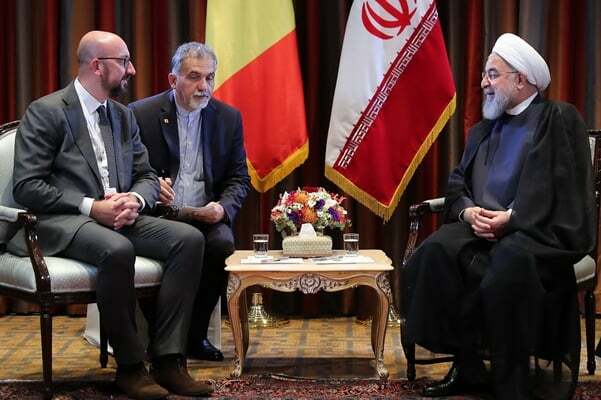 For his part, the Belgian politician expressed his country’s strong resolve to strengthen its ties with Iran and said Belgium is after multilateralism and hopes all articles of the JCPOA is fully implemented. He went on to say that despite the political and economic pressure by the US, the EU seeks to establish a new financial mechanism to strengthen its economic and trade ties with Iran. The Iranian president also held talks with Norwegian Prime Minister Erna Solberg. 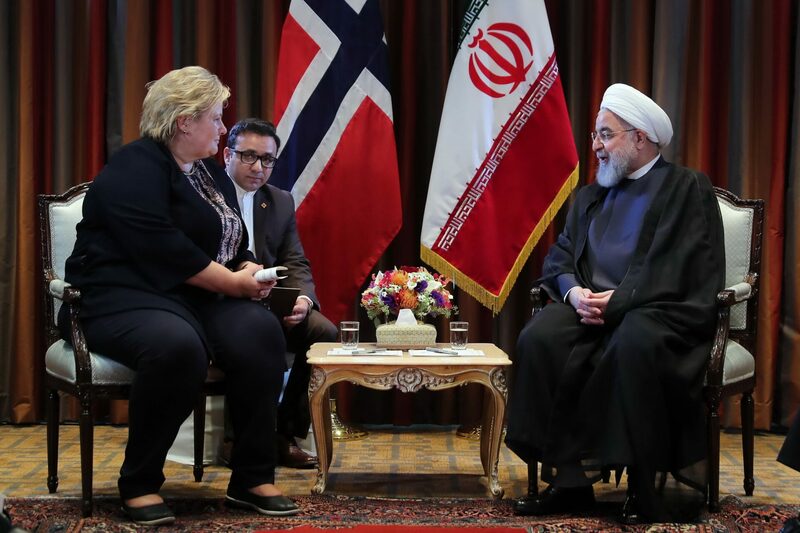 During the meeting, the Norwegian official expressed her country’s preparedness to expand ties with Iran and expressed hope that all states could use the JCPOA as base for further expansion of ties. She expressed regret that the US violated the nuclear deal to meet its political goals. “We are happy that Iran has remained faithful to its commitments under the nuclear deal,” she said, adding the EU is after measures to expand its ties with Iran despite the US pressure. Rouhani, in turn, said the Islamic Republic of Iran will only remain in deals that meet its demands. He once again slammed the US for its unilateral withdrawal from the nuclear deal and said the current problem created by the US is not restricted to the conflict between Tehran and Washington because the latter has already violated a multi-national treaty approved unanimously by the United Nations Security Council. “The Resolution 2231 requires all states to safeguard the JCPOA. So, it is highly important for the whole world not to remain indifferent towards its violation,” he said. President Rouhani once again underlined the EU’s role in safeguarding the JCPOA as a source of global peace and security. He then referred to the devastating situation of people in Yemen and said the aggressors cannot fulfill their targets through airstrikes on the impoverished nation. Rouhani also touched on the Syria’s crisis and elaborated on the cooperation among Iran, Turkey and Syria to press ahead with projects to restore peace to Syria. “Our forces are closely monitoring the ceasefire between Syrian forces and the terrorist groups in the war-torn country. We made good decisions during our earlier meeting in Tehran to stop bloodshed in Syria’s Idlib province,” he said.